Explanation: A cloud of interstellar gas and dust collapses and a star is born. At its core temperatures rise, a nuclear furnace ignites, and a rotating dusty disk forms surrounding the newborn star. According to current understanding, as material continues to fall onto the disk it is heated and blasted back out along the disk's axis of rotation, forming a pair of high speed jets. 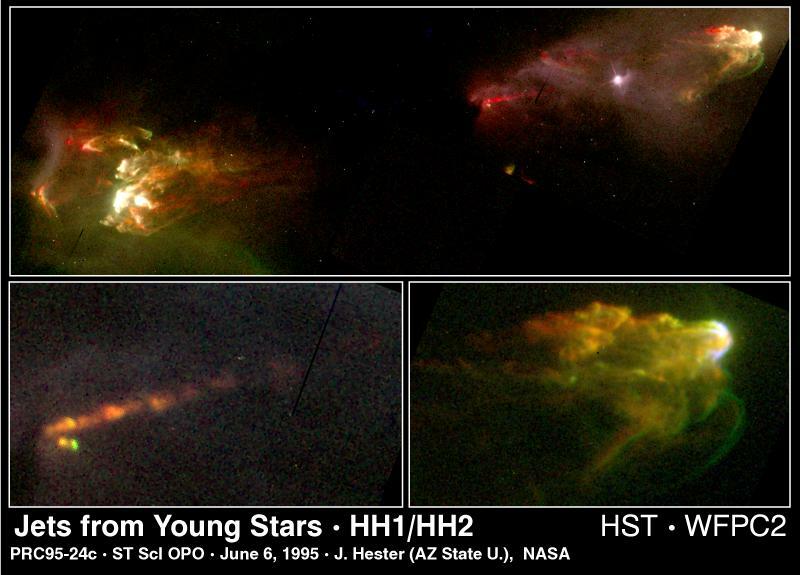 This Hubble Space Telescope image shows two nebulosities at the ends of opposing jets from a young star. The bright blobs at either end are where the jet material has slammed into interstellar gas. Tip to tip, the distance is about one light-year. Located near the Orion Nebula, these nebulosities have catalog designations HH1 and HH2 for their discoverers astronomers George Herbig and Guillermo Haro. The nascent star which produced the jets is in the middle, hidden by a cloud of obscuring dust. Yet the structures and details visible in the star jets offer clues to events which also occured in our own Solar System - when the Sun was formed from a collapsing interstellar cloud 4.5 billion years ago.